A celebration of a life well lived at the Mill Valley Community Center, Feb. 28th 2010. On Sunday I traveled up to Mill Valley to honor and celebrate the life of a man that influenced my life through his writings, workshops, and modeling. George was a life-long learner. He had a passion for learning and exploring the possibilities of this human life. 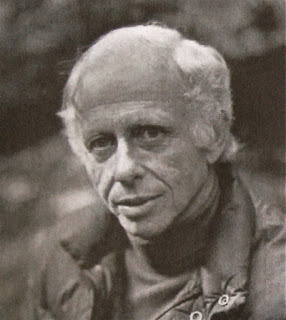 George was one of the authors that I had read that led me to come to Big Sur. During my early years at Esalen I took numerous workshop with him and his partners in Aikido (Wendy Palmer and Richard Heckler). Wendy Palmer and I began to co-lead workshops at Esalen each year. Through my friendship with Wendy I got to know George better over the years. I am deeply grateful for all he brought to me and the world. I recall being both honored and terrified when George and his wife Annie signed up for a workshop I was co-leading at Tassajara Zen Center with the head abbot. Some of what I planned to do with the group was directly or indirectly borrowed from the work of Wendy and George. The thought of "teaching" to George what I had, in part, learned from him seemed overwhelming. To George's credit, he showed up fully as a "student." I was impressed by his gracious and genuine willingness to learn as though he was hearing what I was presenting for the first time. This is rare. My appreciation and respect for George grew from that experience. For a few photos of the event: Memorial. For more on his life: George Leonard.